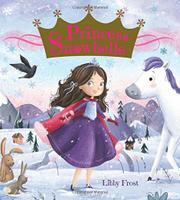 Can Princess Snowbelle overcome her jitters to sing at the Snow Ball? Of course she can—with a little help from her best friend, Sparkleshine. The princess, depicted as a white girl with brown hair and blue eyes, has never sung in front of such a big audience, but her royal parents want her to sing at the ball, and she knows she can do it as long as her best friend is there to play the piano for her. Sparkleshine is depicted as a child of color with brown skin and dark curly hair, and she’s given neither a title nor a family of her own in the text. When Sparkleshine is late arriving at the Opaline Palace for the ball, Princess Snowbelle sets off on horseback to find her, but she becomes lost in the forest. Luckily, a bevy of animal friends help the princess rescue Sparkleshine, and the girls arrive at the palace just in time to change into sparkly dresses and give their performance. Despite a preponderance of princess-y gimmicks in text and art—a magical charm bracelet, for example—the text is lackluster and message-heavy, and the illustrations do little to improve the storytelling. Sparkleshine’s subordinate role is particularly discouraging.